American Academy of CPR & First Aid provides training courses designed by a team of U.S board certified and licensed medical doctors. Our certifications are signed by authorized board certified U.S medial doctors. Take the free online healthcare provider course to acquire skills that could save lives. This course cover a wide range of critical life-saving skills. BLS stands for basic life support. Online BLS course is free and teaches skills for victims of all ages. Board certified medical doctors have designed this free basic first aid course like all of the American Academy courses. This course provides instructions on handling of bloodborne pathogens, identifying hazardous bloodborne pathogens and procedures for dealing with exposure to such pathogens. Learn techniques and methods that could save the life of an adult who undergoes cardiac arrest. This free cardiopulmonary resuscitation course prepares individuals to deal with emergency medical situations. Take the free online combine courses to receive a special discount. These courses cover a wide range of critical life-saving skills that could save lives. All our courses are developed by a team of authorized U.S. board certified & licensed U.S. medical doctors. Our certificates are accepted by nursing homes, schools, hospitals, gyms, government agencies, day-cares, hospitals, home-care agencies, & all medical professionals. Plumbers, tattoo artists, construction workers, massage therapists, libraries, & many other professionals & settings have completed the work & been certified. What separates us from other online certification courses? How long do our courses take to complete? Does a course have to be completed all at once? Getting an online CPR certification or CPR recertification is easier than ever before at The American Academy of CPR and First Aid, Inc. Our online CPR training course is one of the easiest and most convenient options currently available for CPR certification. You can complete our online CPR and first aid certification course and obtain your CPR certification in under one hour from any computer or mobile device with internet access. Our online CPR certification is nationally accepted and can be used for employment purposes or for personal training in case of an emergency. With our affordable and accessible training and CPR certification courses, you will find it very easy to fulfill your CPR certification or recertification requirements. With our online CPR certification course and CPR training, you can choose to start your free online CPR training whenever it is most convenient for you. You can start viewing our free online CPR training material right now, and you won't have to sit through a 5 to 6-hour CPR course any longer just to earn an online CPR certification or renewal. This offers you unparalleled convenience that you won't be able to find with other offline CPR training options or online CPR certification or renewal courses. Our online CPR certification and CPR recertification courses have become a popular option for CPR training for medical providers, first responders, lifeguards, child care providers, and any other individuals who need or are interested in CPR training or CPR certification. According to Wikipedia, cardiopulmonary resuscitation consists of chest compressions and breaths that create artificial circulation, which encourages blood to flow through the heart into parts of the body. It gives an overview of this life-saving procedure- and the importance of doing the techniques properly! Our online CPR certification and recertification courses and training materials were developed by a Board Certified physician and they were designed with the highest accuracy and professionalism. Our training material and certification courses are based on the latest globally accepted cardiopulmonary resuscitation protocols and techniques for CPR training. You can access our free online CPR training material anytime you wish prior to purchasing a certification course to see the quality for yourself. You can trust in the accuracy of our online CPR certification and recertification course and training material no matter what purpose you are using it for. Our training material is also extensive and detailed, and covers everything that you will need to know in order to earn your full online CPR certification or renewal. You can obtain your certification in roughly 20 to 30 minutes for each courses. We offer online training and certification for Healthcare providers, Basic Life Support, First Aid, Bloodborne Pathogens, as well as an Adult CPR certification course. You can choose to take all of these online CPR certification and training courses at once, and obtain your certification or renewal in just a few hours after finishing your training. If you performed your training offline instead of using our online CPR certification option, it would require you to schedule each course individually. This would cost you substantially more money for your CPR training and force you to take several hours out of your schedule just to obtain your certification or renewal, or take your first online certification class. 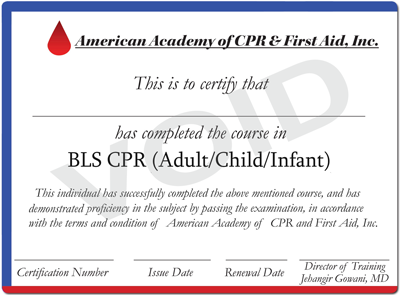 You will receive both a wallet card and printable online CPR certification card that you can be used right away when you pass the online CPR training courses. This allows you to prove that you completed a course immediately while you await your wallet card. There's no other method as fast and easy as our courses for online CPR certification, BLS and related certifications. You can also combine our CPR training and CPR certification courses and receive discounts on their cost and shipping discounts as well. With our online CPR certification and training option, you can save both time and money and earn your first certification or renewal on your own terms. There's no better way to participate in a CPR course, and you can even check out our free online CPR training material without having to purchase the certification upfront. Check out any of our CPR and first aid certification courses today and see the difference that the American Academy of CPR and First Aid, Inc. makes for you!